The Šiauliai Regional State Archives (Li: Šiaulių krašto valstybinis archyvas) is one of the State Archives in Lithuania. The Šiauliai Regional State Archives preserves documents of regional state, municipal, non-state institutions, enterprises and individuals of the Šiauliai, and Panevežys counties from 1945 until the present day. The Archives is also involved in supervision of records management of local public institutions. Fonds (collections) relating to the period of independence (since 1990): documents of the state institutions and local governments, other organisations and institutions, industrial enterprises, as well as non-governmental institutions, private legal entities that were and still are functioning on Šiauliai and Panevėžys Counties. Any digitized records of the Šiauliai Regional State Archives will be hosted at the National Library site, ePaveldas.lt. 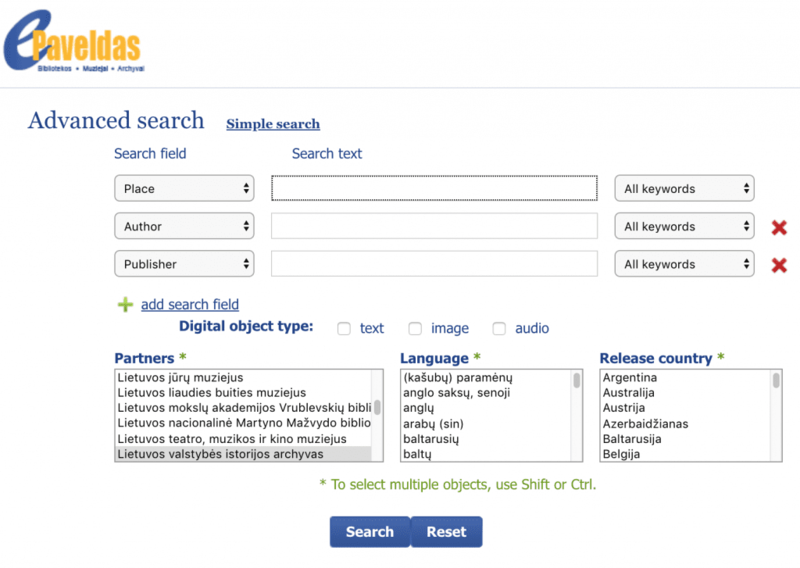 You can see any online collections from this archive by using the advanced search window at ePaveldas.lt and filtering search results by “Lietuvos valstybės istorigjos archyvas” or use the Search field and filter by one of the locations (with or without the diacritics) overseen by this archive (Šiauliai and Panevežys).